Left: Pimm's No. 1 Cup. Pimm's No. 1 Cup is based on gin and can be served both on ice or in cocktails. It has a dark tea colour with a reddish tint, and tastes subtly of spice and citrus fruit. It is often taken with "English-style" lemonade, as well as various fruits including apples, oranges, lemons, strawberry, cucumber and mint. Pimm's is also mixed with champagne (or a sparkling white wine), called a "Pimm's Royal Cup." It is 25% alcohol by volume. It can also be purchased as a pre-mixed fortified lemonade (Pimm's & Lemonade) in 250 ml cans or 1-litre bottles, at 5.4%. Pimm's No. 2 Cup was based on Scotch whisky. Currently phased out. Pimm's was first produced in 1823, by James Pimm, a farmer's son from Kent who became the owner of an oyster bar in the City of London, near the Bank of England. Pimm offered the tonic, (a gin-based drink containing quinine and a secret mixture of herbs) as an aid to digestion, serving it in a small tankard known as a "No. 1 Cup", hence its subsequent name. Pimm's began large-scale production in 1851 to keep up with sales to other bars. 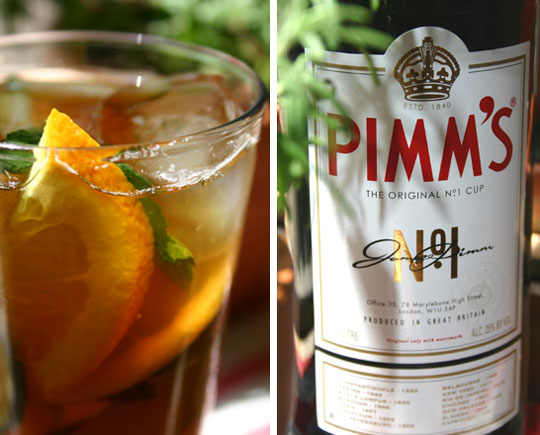 Over the years Pimm's extended their range, utilizing a number of other spirits as bases for new "cups". In 1851 Pimm's No. 2 Cup and Pimm's No. 3 Cup were introduced. After World War II, Pimm's No. 4 Cup was invented, followed by Pimm's No. 5 Cup and Pimm's No.6 Cup in the 1960s. Pimm's is most common in Britain, particularly Southern England. It is one of the two staple drinks at Wimbledon, the Henley Royal Regatta, and the Glyndebourne opera festival, the other being Champagne. A "Pimm's Cup" is also the standard cocktail at British and American polo matches.